After lots of Christmas themed blog posts I'm finally breaking the trend by bringing you a delicious special occasion cake! As I've mentioned previously I had a go at making a special cake for my Dad's birthday which was actually the week before Christmas. I make cakes quite a bit, so I wanted to try something I hadn't done before and a little bit more of a 'showstopper'. After much browsing for inspiration I decided to have a go at make a Beer Glass birthday cake. 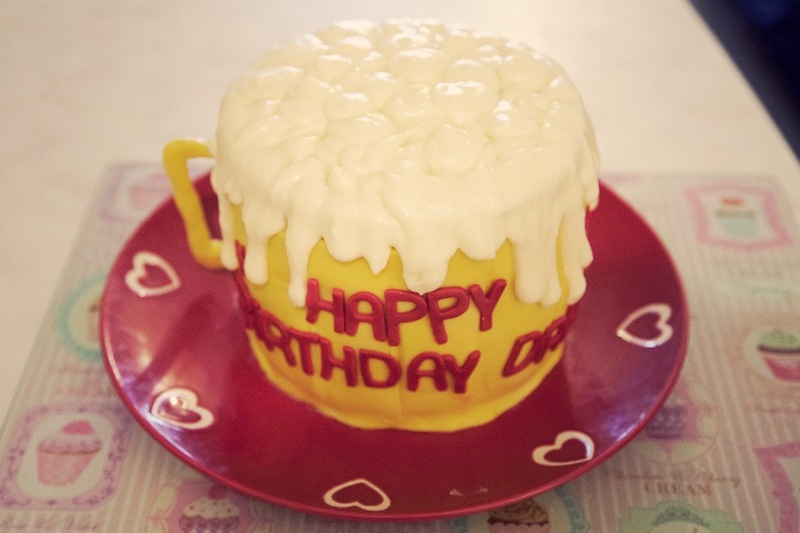 The general idea is that the cake resembles a traditional glass beer stein with foam dropping over the edge. 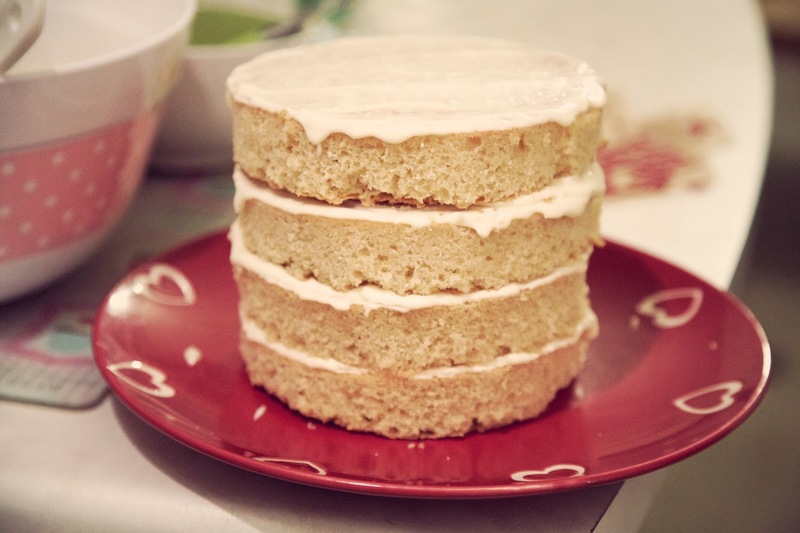 The cake itself is tall and thin, (like a glass) unlike traditional Victoria sponges which tend to be two layers sandwiched together and quite wide. Unfortunately my first sponge was a disaster that completely stuck to the pan leading me to make the salvageable pieces into cake balls! Fortunately my next attempt faired a lot better and I was able to bake three sponge layers to work with. The next step was to cut and assemble the layers. I used a regular cereal bowl as a template to cut around to make all the layers the same size then I sandwiched them together with icing. I decided to make a cream cheese icing because it's a bit lighter than buttercream (four layers of buttercream seemed a bit much!) and I made a bit runnier than usual for the cake topping. I crumb-coated the entire cake with the icing ready to attach the fondant. I've never used fondant to cover a cake before so this was a bit of a learning experience for me! I rolled out the yellow icing in a long rectangle and then measured and cut it to size using a ruler. I tried to wrap the fondant around the cake as tightly as possible but as you can see there are some bulges! 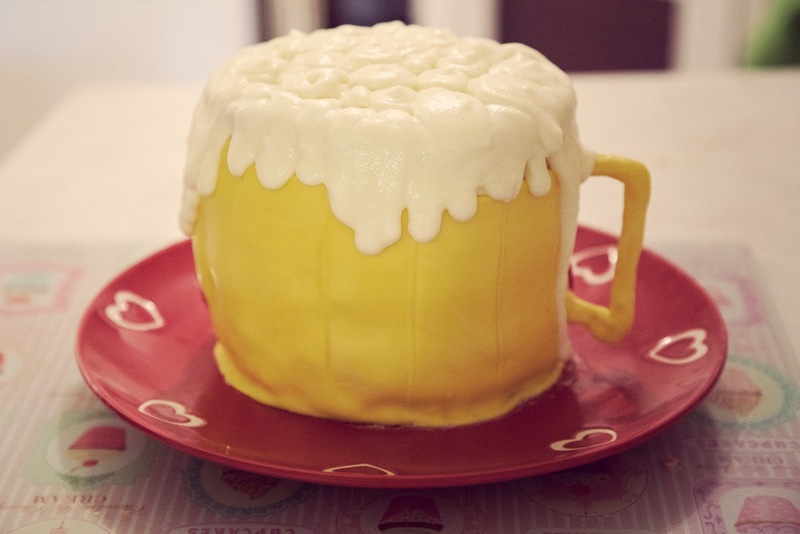 To give the effect of a beer glass I used a knife to score lines down every inch of the cake. Then I piped over the runny icing making sure to let it drip down the sides. 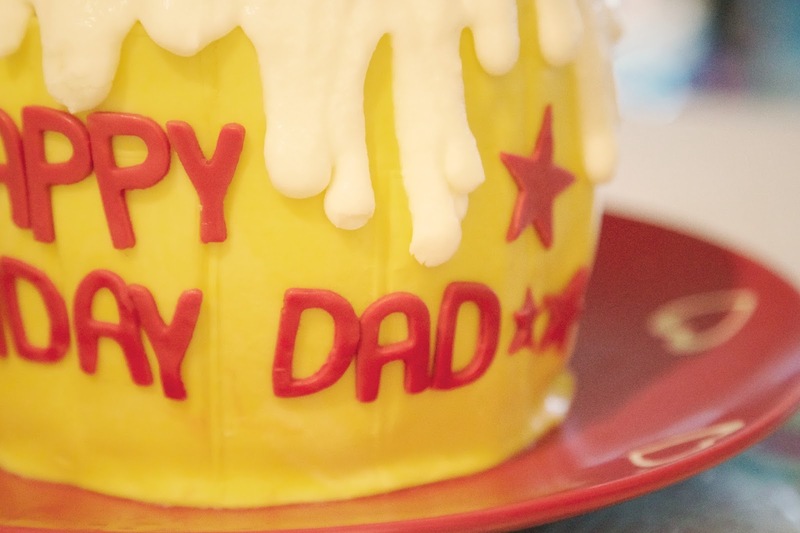 As a finishing touch I used some red fondant and letter cutters to spell out 'Happy Birthday Dad' and added some fondant stars too. I also crafted a handle out of yellow fondant and tooth picks! Overall I was really happy with how the cake turned out, it wasn't perfect but I don't think it looks bad at all for a first attempt! 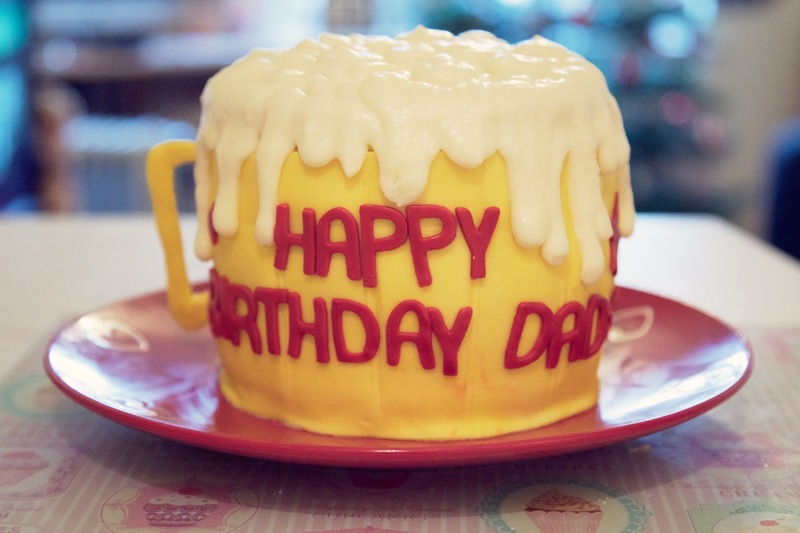 My Dad was really chuffed with the effort I had gone to for his special cake - and it tasted pretty dam good too!